The wheels of its top-end variant get full covers, whereas the K10 LXi comes with only a centre cap. Its 13-inch tubeless tryes contribute to its stability and ride quality. The 155/65R13 size of tyres is used for both the variants. The redesigned rear instantly feels like the old Zen.The new tail lights, tailgate with wedge and rear bumper have maintained the aesthetic feel of the car. Both the variants Lxi and VXi carry total kerb weight of 760 kg and 765 kg, respectively. The car is available in six attractive colors – Fire Brick Red, Midnight Black, Sunlight Copper, Ecru Beige, Silky Silver and Superior White. The Maruti Suzuki Alto K10 has interior space to accommodate five persons. However, five adults with three on the rear bench can be a bit of a squeeze. Plastic quality of the dashboard is decent and build quality is acceptable. The dashboard houses an instrument cluster, a piano black finished stereo with CD, AUX-in and USB along with AC controls. Silver accents on the steering wheel add a bit of premium feel to the cabin. The Maruti Suzuki Alto K10 comes with a dual tone interior in a combination of black and beige with the lower portion of the dashboard in beige along with a portion of the door panels and the fabric seats. Interior of the Maruti Alto K10 has been given a stylish and impressive look. The car is more on space while the rear seats provide extra knee room to the occupants. Dashboard gets the combination of beige and blackish-grey that goes well with the design. The steering wheel is also modified and instrument cluster appears to be more improved version as seen in Alto 800. Maruti has worked on the music system for the top-spec models, it now gets the piano black colored 2-DIN system that supports USB and AUX. Additional features include keyless entry, air conditioning vents, rear combination lamps and fabric upholstery. Looking at the safety aspects, Maruti Alto K10 gets features like driver side airbag, central locking, child safety lock, engine immobilizer and power door lock. The Maruti Suzuki Alto K10 has a certified mileage of 24.07 km/l for the petrol powered engine in the 5-speed manual transmission and Auto Gear Shift (AMT). In the CNG variants, the A-segment hatchback delivers 32.26 km/kg.The K-series engine is known for its excellent fuel efficiency. And this time around, Maruti claims of significant improvement in this area. Both manual and AMT variants of Alto K10 returns ARAI certified mileage of 24.7kmpl, thanks to the retuning and lighter kerb weight. The braking is at par with the contemporaries and progressive with a better bite on the road. The braking system works in line with the regular driving style but not tuned for hard driving. Not much can be expected when it comes to safety features in budget hatchbacks. But you still get optional driver side airbag, central locking, engine immobilizer and child safety lock.The Maruti Suzuki Alto K10 has side door impact beam along with rigid crumple zones for added occupant safety. Brakes are courtesy a pair of discs at the front and drum at the rear. All variants of the Maruti Suzuki Alto K10 has an immobiliser, 3-point ELR seatbelts and the top-end VXi (O) variant gets a driver airbag as well. 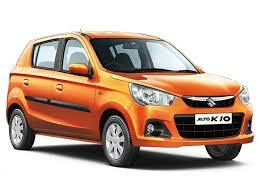 The Maruti Suzuki Alto K10 is an A-segment hatchback by the Indian carmaker. It is powered by a 998cc K10B petrol engine. The motor generates 67hp of max power at 6,000 rpm and 90Nm of peak torque at 3,500 rpm for the petrol powered version. However, the engine has been tuned down for the CNG variants at 58hp and 78Nm. The Maruti Suzuki Alto K10 also comes with and AGS (Auto Gear Shift) or automatic transmission in addition to a 5-speed manual transmission. Certified mileage of this hatchback is 24.07 km/l for the petrol version in both gearbox options and 32.26 km/kg for the CNG variants.